A band of metal. This band is of pewter and silver with a name etched on the silver plate. It reads: Capt. Herbert C Crosby, January 10, 1970. It’s not fancy. It’s sentimental. Priceless. This bracelet, a band of metal was given to my father in 1970, by a friend. It was a time when people were wearing POW/MIA bracelets to remember American prisoners and missing soldiers in Southeast Asia. 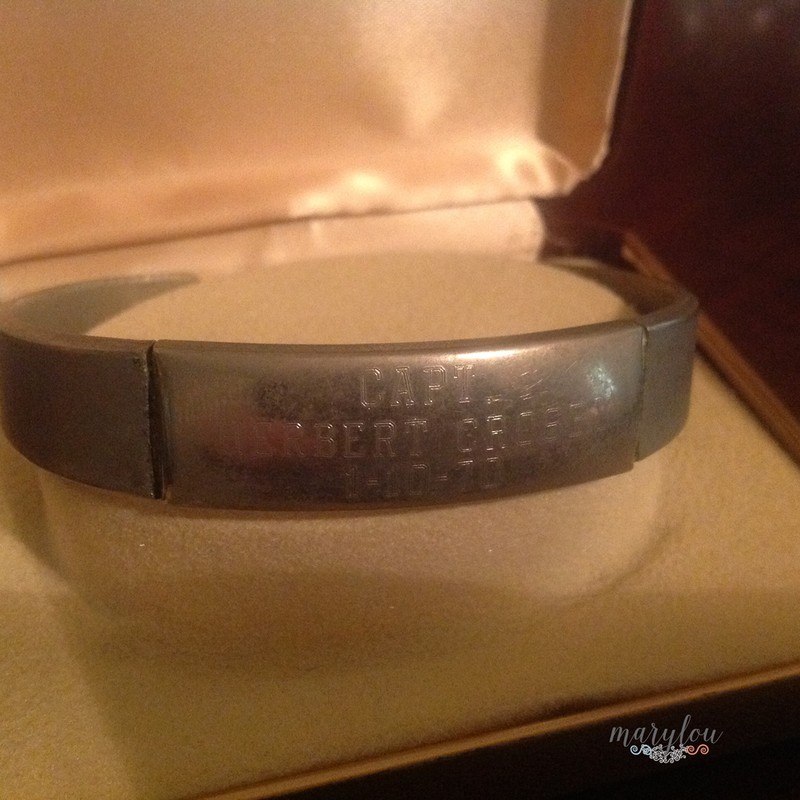 One was to wear the bracelet until the soldier whose name was etched on it came home, and upon his return, the person would give the bracelet to the soldier’s family. Mr. Billy, our local jeweler and family friend, knew how desperate my dad was to find his son who was missing in action in Viet Nam. He wanted to do something special to show his support so he made his version of the bracelet to give to dad. As I opened the faded bracelet box to write this story the memories came rushing in. I don’t remember the actual presentation but in mind’s eye, knowing Mr. Billy, I can see him, tears flowing down his hopeful face while presenting this band of metal to dad. Words weren’t really spoken, the meaning spoke volumes. A small token for a huge outpour of love, support and hope. Dad never gave up hope. Sadly, answers never came to him before died in 1991. It was 15 years later his son, my brother’s remains would come home, and 37 years after this bracelet inspired an outward show of hope. After dad’s death or probably years before that really, this band of metal was tucked away in the velvet lined jewelry box in his dresser drawer. It shows much wear and tear, just as was evident on my father’s heart all those years of doing everything possible to find his son.